Telekinesis, the nom de plume of Seattle’s Michael Benjamin Lerner, is out on tour in support of his fourth record, Ad Infinitum, and played the Independent in San Francisco on October 6th. With a rotating cast of touring members, the current incarnation of Telekinesis features Rebecca Cole (The Minders,Wild Flag) as a carryover from the last tour on keyboards, and Eric Elbogen on base. Elbogen’s solo act, Say Hi, also played an opening set (heavy on sampler and songs about vampires) after San Francisco’s NRVS LVRS kicked off the show. 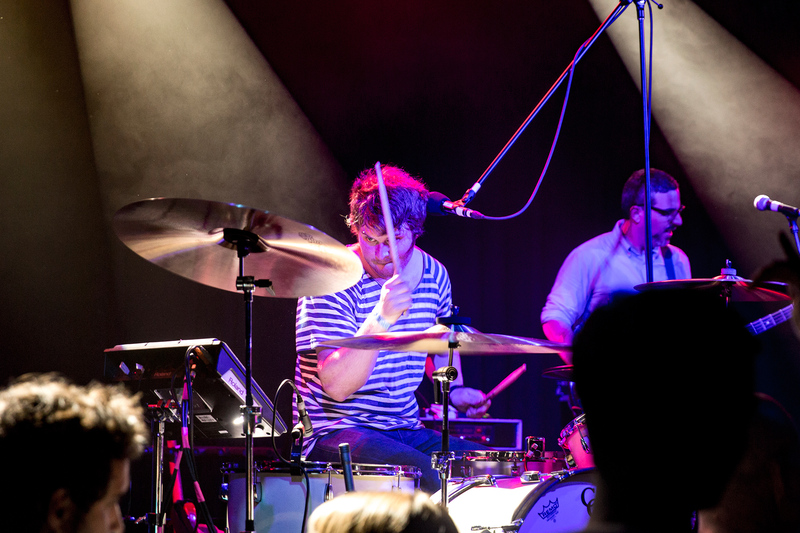 Despite being one of the preeminent singing drummers in indie rock today, Lerner has made a decided shift away from the drums+guitar pop of his first two records, toward a more synthesizer/drum machine-based sound, and that was reflected in the setlist, with the over half the songs coming from Ad Infinitum and 2013’s Dormarion. He did close with two songs from the self-titled Telekinesis record, “Coast of Carolina” and “Tokyo,” the latter of which he invited crowd members to join him onstage and many taking him up on the offer. The show ended without an encore, which is just as well since it would have been awkward to try to get all those people off the stage to continue the show.